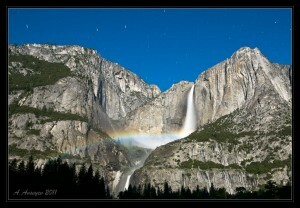 My frist attempt to photograph well known phenomenon called Moonbow in Yosemite. June’s Moon Bow was perfect in sense of intensity and also because occurred at nights from Friday and Saturday and then with less intensity from Saturday to Sunday which is very convenient for working people like me. Anyway, my first attempt of taking picture of bow was close to blow… no pun intended here. First off, me and my friend were too late for event. Second, when we finally arrived to Yosemite valley, we rushed toward the lower fall Vista Point and got lost in the middle of woods. When we reached the Vista, it was already packed with literally hundreds of photographers and tourists. I was impossible to get a spot for picture. It was also a bad idea to be there because lower fall was at its peak and was making everything including lens and camera wet in seconds. I missed on everything: exposure, focus, composition…. When I eventually figured out right composition and exposure, I forgot about focus and clean up the lens. And then bow disappeared. It was sad. Anyway, we’re learning on our own mistakes. I promis not to make same mistakes next year.